"If this one doesn't scare you, you're already dead." Horror fans already know this one well. Back in 1979, director Don Coscarelli introduced The Tall Man and his deadly silver Sentinel Spheres to the world in a sci-fi horror film called Phantasm. The film built up a cult following over the years and, believe it or not, they're just about to release the fourth sequel titled Phantasm: Ravager (see the trailer for that here). 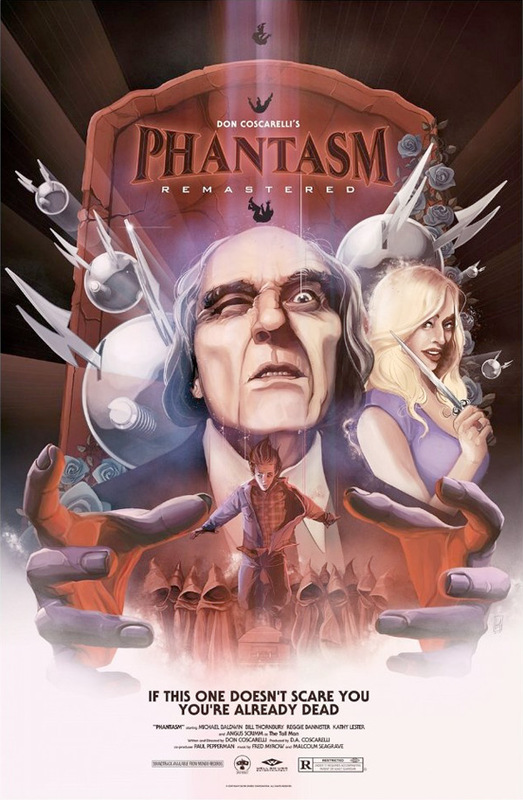 In addition to the release of that new film, Coscarelli's original film that started it all is getting a re-release as Phantasm: Remastered. This brand new 4K rereleae also features remastered 5.1 surround sound, all overseen by J.J. Abrams and the folks at Bad Robot. The film stars A. Michael Baldwin, Angus Scrimm, Reggie Bannister and Bill Thornbury. If you've never seen this film, it's worth checking out. Seriously. Since its release in 1979, Don Coscarelli's epic tale of The Tall Man, his deadly silver Sentinel Spheres, and group the small town friends who must band together to stop his dimension-hopping schemes has captivated and terrified horror and sci-fi fans around the world. An immediate success, bringing in 40 times its production budget, the film has influenced generations of filmmakers. Thirty-seven years later, Phantasm has been finally restored to its original glory by J.J. Abrams' Bad Robot and Coscarelli, with a stunning new 4K remaster and 5.1 surround sound mix from the original elements that ensures Phantasm will be around to scare the hell out of generations to come. Don Coscarelli's Phantasm was first released in 1979 by AVCO Embassy Pictures. Both Phantasm: Remastered and the new fifth film, Phantasm: Ravager, will be available on VOD starting October 4th, and in select theaters October 7th. Ready to revisit this? Hot diggity that looks like a flawless remastering! // I will never be able to scrub the Tall Man from my dreams. I heard about it in the 80s, but was never compelled to watch it. Maybe because I'm not a fan of the horror genre. Is it any good? The poster is great. it's good in a cult movie kind of way. Gotcha. It plays like a scary inside joke. ;D Shakmaaaaa!! I've never seen this film, so I can't say it isn't good or scary, but I CAN say with 100% confidence that it has some of the WORST acting I have ever seen. If a 2 minute trailer has that many awful scenes, it just might be worth a rental for the laughs. But that's all. Most of these cheesy horror films were funnier than the comedies of their time. You are VERY wrong. I am a child of the 70's/80's, and maybe I am biased, but this is a great, original horror film. Give it a shot! So you're telling me the acting is good then? The acting is indeed not good, but it would be a shame for someone to miss this movie because of it. This is also a pretty fun/funny movie to watch, in a tongue in cheek way, but not in a so-bad-it's-good way either. I guess that's why they call it unique. It has a mysterious atmosphere like a mix between David Lynch and Dario Argento, while also being just surprisingly imaginative and unexpected. Recently seen this and was amazed. Great trailer, but if you haven't seen the movie before, better watch it having seen/read as little of it as possible beforehand; it will make the experience so much more surreal/better.